Winter Squash Dog Muffin Recipe - This hearty muffin will help warm your dog inside and out. Winter squash, which includes butternut, acorn and spaghetti squash, just to name a few, are loaded with vitamins. 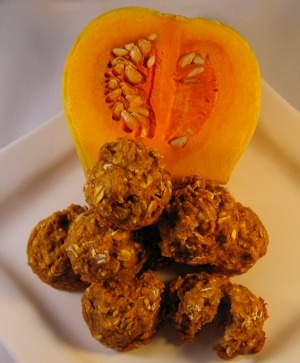 These squash are also low in calories and high in fiber, which makes them perfect for the dog that has overindulged in delicious homemade dog treats. Make 24 mini muffins to share, or to freeze for later rewards. Or, make these muffins to hide dog medicine or supplement pills. They are soft and healthy enough to give everyday to make pill time a little more enjoyable. January is the month that will all start to put a fresh foot, or paw forward. So, not only can you take advantage of what's in season, you can feel good about giving your dog a low calorie, yet hearty homemade dog treat. "When making cookies for my fur-baby...using cookie cutters takes a long time. I roll the dough out rather thin, say 1/8 inch thick, cut unto i inch ribbons and then into 1 inch squares, using kitchen scissors. Then, bake on a cookie sheet until dry. After all are baked, I put them in a metal colander and return to low oven with a low heat to make sure the "chips" are completely dry, and store in an air tight container. Another quick way to fashion pretty cookies is to roll dough into marble size balls and flatten with a glass with a pretty shape on the bottom (lightly flour the glass for ease of pressing the dough ball). Make cookies about the size of a 50 cent piece and thin, this makes pretty cookies and is fast to do." Share your dog treat tips with your fellow bakers! We know you have lots of great ideas, ways of making and creative ways of decorating homemade dog treats. Share your tips and they might be featured in our newsletter. Or, if you have a baking question you'd like answered here, let us know and the answer may be published in the next issue. Last month was a busy month, so we wanted to remind you of our new feature on DogTreatKitchen.com. We think every dog should have their very own web page, so don't delay, Show Us Your Taste Testers! We know you're not baking for yourself, so introduce us to who you're baking for! :) Create a web page just for your dog, tell us their favorite treat, what makes them special, or anything else you'd like to add. Don't forget to add lots of cute photos of your dog. While everyone's attention is directed to loved ones, we're going to take a closer look at your dogs heart. Keep your best buddy by your side longer with heart healthy dog treats, like our Spinach & Carrot Dog Cookies. We'll combine the heart healthy properties of both spinach and carrots to boost your dogs immune system and help her heart to beat strong.